(Sept 7): U.S. stocks rose slightly on Tuesday, nudging the Nasdaq to a record high close, as economic data bolstered views the Federal Reserve may decide against raising interest rates in the near term. The S&P financial index, which tends to rise with expectations for higher rates, slipped 0.2 percent, while the S&P utilities index, which tends to benefit from a lower rate environment, rose 1.1 percent. A weaker-than-expected reading on the U.S. services sector in August added to views the Fed will refrain from raising interest rates at its meeting this month. The Fed is "not getting support from data for a rate increase, and so we're seeing the market creep a little higher today," said Bucky Hellwig, senior vice president at BB&T Wealth Management in Birmingham, Alabama. Stocks should benefit from a continued environment of low rates and the Fed on the sidelines as long as economic data doesn't show significant slowing, he said. The chances of a rate hike in September dropped after the data, according to CME Group's FedWatch tool. 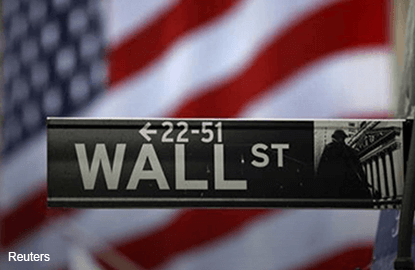 The Dow Jones industrial average closed up 46.16 points, or 0.25 percent, to 18,538.12, the S&P 500 gained 6.5 points, or 0.3 percent, to 2,186.48 and the Nasdaq Composite ended up 26.01 points, or 0.5 percent, at 5,275.91, a record high. Though oil prices ended lower, the S&P 500's energy index rose 1.5 percent, helped by Enbridge's acquisition of Spectra Energy for about $28 billion. Spectra jumped 13.4 percent to $41. Navistar gained 40.7 percent to $19.79 after Volkswagen agreed to supply engines to the U.S. truck maker in exchange for a 16.6-percent stake. Other big gainers included Cepheid, which jumped 52.6 percent to $52.53 after the diagnostics company agreed to be bought by Danaher for $4 billion, including debt. Danaher's shares were down 2.1 percent. Advancing issues outnumbered declining ones on the NYSE by a 1.43-to-1 ratio; on Nasdaq, a 1.15-to-1 ratio favored advancers. The S&P 500 posted 37 new 52-week highs and no new lows; the Nasdaq Composite recorded 168 new highs and 20 new lows. About 6.6 billion shares changed hands on U.S. exchanges, above the 6.0 billion daily average for the past 20 trading days, according to Thomson Reuters data.